Art Gladius Swords are finely crafted decorative Medieval and fantasy styled swords. All blades are crafted in polished stainless steel with beautifully detailed hilts. The Art Gladius Agincourt Sword has a 440C stainless steel blade, which is fully tempered, but they are primarily intended for use as collectibles and decorative pieces. The Art Gladius Agincourt Sword with Scabbard has a 440C stainless steel blade, which is fully tempered, but primarily intended for decorative use. This Art Gladius Cinquedea Sword has a 440C stainless steel blade, which is fully tempered, but primarily designed for decoration. This Art Gladius Christopher Columbus Sword has a 440C stainless steel blade, which is fully tempered, but primarily intended for decoration. This Medieval Arming Sword has a blade made of carbon steel. The Blade is 29.5", overall length is 39" with a black leather grip. This Art Gladius Crusader Sword with Brass Hilt has a 440C stainless steel blade, which is fully tempered, but primarily intended for decoration. This Art Gladius Excalibur Sword - Cadet size has a 440C stainless steel blade, which is fully tempered, but primarily intended for decoration. This Art Gladius Hattin Sword has a 440C stainless steel blade, which is fully tempered, but primarily intended for decorative use. This Art Gladius Hattin Sword with Leather Scabbard has a 440C stainless steel blade, which is fully tempered, but primarily intended for decorative use. The Art Gladius Jerusalem Sword has a 440C stainless steel blade, which is fully tempered, but primarily intended for decoration. The Art Gladius Dagesse Sword is a medieval style sword that features a blade that widens as it approaches the hilt. The Blade is 26.5", made from carbon steel. Overall length is 36.5" with a polished wooden grip. The Art Gladius Dagesse Sword with Leather Scabbard is a medieval style sword that features a blade that widens as it approaches the hilt. The Blade is 26.5", made from carbon steel. Excalibur Sword with Bronze Hilt - Excalibur, the fabled sword of King Arthur, evokes scenes of the Sword in the Stone, the Lady of the Lake and Camelot. 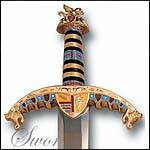 Excalibur Sword in Gold - Excalibur, the fabled sword of King Arthur, evokes scenes of the Sword in the Stone, the Lady of the Lake and Camelot. Excalibur Sword in Black Gold - Excalibur, the fabled sword of King Arthur, evokes scenes of the Sword in the Stone, the Lady of the Lake and Camelot. Bronze Julius Caesar Sword - The great Julius Caesar, head of the Roman Empire, left his mark in history as both a military leader and an Emperor. Bronze Robin Hood Sword - Recalling stirring tales of the famous outlaw and his band of "Merry Men" and their battles with the forces of the Sheriff of Nottingham, Gladius' Robin Hood sword is a powerful hand-and-a-half design. Valiant Prince Sword - The Black Prince, son of Edward III of England, is remembered in history for his great victory over the French at the Battle of Agincourt during the Hundred Years' War. Black Prince Sword - The Black Prince, son of Edward III of England, is remembered in history for his great victory over the French at the Battle of Agincourt during the Hundred Years' War. Excalibur, the fabled sword of King Arthur.The graceful lines of this piece by Gladius fit the image of the warrior king of the Britons. One of Gladius' most popular swords, the Barbarian sword is a massive double-edged fantasy sword with dragon head guards and engraved serpent designs, recalling death-defying battles with the forces of evil. Art Gladius Persian War Sword with Brass Hilt- Based on historical research and data, this sword reflects the Greek Persian influence with a stylized single edged blade and richly decorated golden hilt. A magnificent collectors piece from Art Gladius. Art Gladius Persian War Sword - Black and Gold - Based on historical research and data, this sword reflects the Greek Persian influence with a stylized single edged blade and richly decorated hilt. A magnificent collectors piece from Art Gladius. Black Knights of Heaven Sword, Gladius Medieval style swords have 440C stainless steel blades, which are fully tempered. This Art Gladius Jerusalem Sword with Leather Scabbard has a 440C stainless steel blade, which is fully tempered, but intended primarily for decorative use. This type of Sword was used during the Medieval Ages to fight on a horse back or in hand to hand combat. The White Knight Sword has a broad blade ending in a narrow point. This type of Sword was used during the Medieval Ages to fight on a horse back or in hand to hand combat. The White Knight Sword, with Leather Scabbard, has a broad blade ending in a narrow point. This highly decorative Black Prince Dagger with Scabbard makes a great accent piece. The ornate detailing is perfect for home decor use. Gold Julius Caesar Sword - The great Julius Caesar, head of the Roman Empire, left his mark in history as both a military leader and an Emperor. Gold Robin Hood Sword - Recalling stirring tales of the famous outlaw and his band of "Merry Men" and their battles with the forces of the Sheriff of Nottingham, Gladius' Robin Hood sword is a powerful hand-and-a-half design from the days when the sword was law. Richard the Lionheart Sword - Son of Henry II and King of England 1189-99, Richard I was known as a very powerful king, a chivalrous knight, and a fearless warrior. He was called Coeur de Lion or Richard the Lionheart. This Richard the Lionheart Sword with Silver and Gold Hilt is a beautiful representation of the sword he carried in his quest for Jerusalem. Recalling stirring tales of the famous outlaw, his band of Merry Men, and their battles with the Sheriff of Nottingham. Our Art Gladius Robin Hood sword is a powerful hand-and-a-half design from the days when the sword was law. The Gladiator Gladius is an authentic reproduction Sword worthy of the men of the worlds first great military empire. The Persian Ceremonial Sword- Brass Hilt- A magnificent collectors piece from Art Gladius. This Persian Ceremonial Sword has a steel colored hilt. Based on historical research and data compiled over the past eight years this sword reflects the Greek Persian influence with a stylized double edged blade and richly decorated Black and Gold Hilt featuring some of his famous victories. Silver Knights of Heaven Sword from Gladius. In June of 1099, the Crusaders conquered Jerusalem. Twenty years later, nine Crusader Knights took a vow of poverty, obedience and chastity.